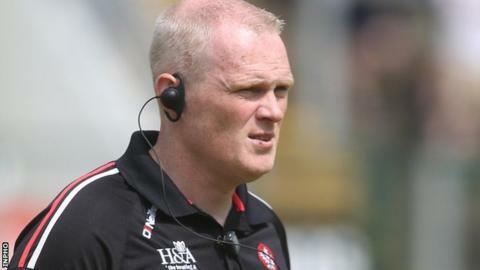 Two second-half goals from Shane McGuigan helped Derry beat Leitrim 2-16 to 1-12 in the battle of the two promoted teams in Division Four of the Football League at Celtic Park. Derry only led 0-8 to 0-7 at half-time but then hit four unanswered points after the break before McGuigan's first goal on 49 minutes. Gary Plunkett netted for Leitrim before McGuigan's second goal. Matt Fitzpatrick's two goals helped Antrim beat Wicklow 2-15 to 0-10. Two points apiece from McGuigan and Christopher Bradley helped Derry lead 0-4 to 0-2 early on at Celtic Park but Leitrim responded to move one ahead before the Oak Leafers regained the advantage by half-time. Derry started the second half impressively as Conor McAtamney, Bradley (two) and McGuigan tagged on points before the goal came on 49 minutes as the unmarked McGuigan finished to the net after a high ball into the Leitrim defence. Plunkett's 58th-minute goal cut Derry's lead to 1-15 to 1-8 but McGuigan notched his second three-pointer in the 65th minute. The sides will meet again in the Division Four Final on 30 March. At Corrigan Park, Wicklow led 0-6 to 0-3 in the first half but Antrim fought back to lead 0-7 to 0-6 at half time helped by two Ryan Murray points. A unanswered run of 1-4, which included Fitzpatrick's first goal on 41 minutes, then guaranteed Antrim's second league win of the season. Fitzpatrick clinched a comfortable win when he hit his second goal two minutes from time.